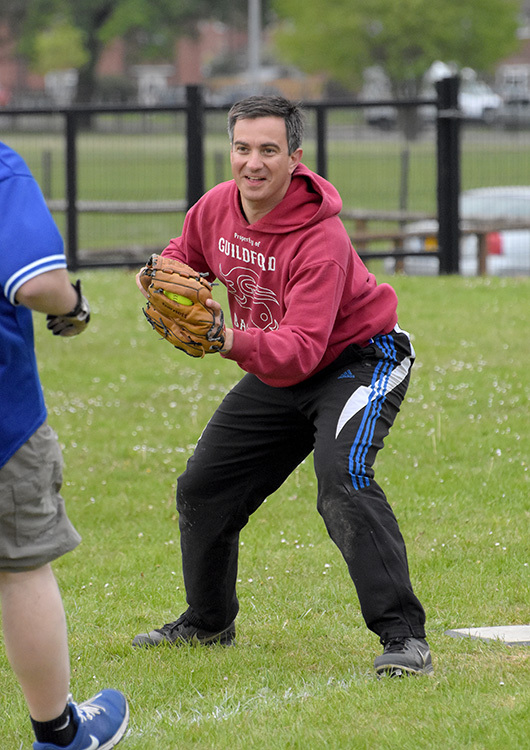 After the Guildford Juniors hosted the Brackell Juniors on Saturday, the two adult teams met at Westmorland Park in Bracknell to play a 9 inning BBF Single-A fixture on Sunday. In the first inning, both pitchers struggled for command with a number of hit batters and walks issued resulting in a long first inning. The Mavericks scored 8 runs in the top of the inning with aggressive base running and good plate discipline. Michael Garner started on the hill for the Mavericks and allowed 7 straight base runners in the bottom of the first before Rob Wheeler, making his first start at catcher for a few years, gunned down a runner at third base where Chris Lary was waiting to tag his man. This spurred the Mavericks to tighten up and get out of the inning with a slim 1 run lead. The bottom of the Mavericks order were ineffective in the 2nd whilst Bracknell scored 4 runs on 2 doubles to take the lead. The Mavericks immediately hit back with 5 runs of their own from the top of the order in the third taking back the initiative in what was turning out to be a close battle. After this, the Mavericks went on a scoring drought, putting up 0’s in the 4th, 5th and 6th inning whilst Bracknell Inferno scored at least one run in each inning. Adam N. crushed a solo home run for the hosts and chased Garner from the game in the fifth. Heydenrych took the mound after 5 1/3 inning with Garner now occupying short stop, Chris Ward moved over to first base. Entering the top of the seventh, the score was 13-16 to the Inferno. Centre Fielder Danny Lloyd led off the top of the inning and hustled to first after being struck out on a pass ball. Garner, having been relieved on the mound by Mat Heydenrych, could concentrate on hitting and smashed a huge double scoring Lloyd before stealing third. Wheeler then stepped up to knock Garner in on a 5-3 ground out. Heydenrych then reached base having been hit by a pitch. Lary then stepped up to hit a deep RBI double before scoring himself. 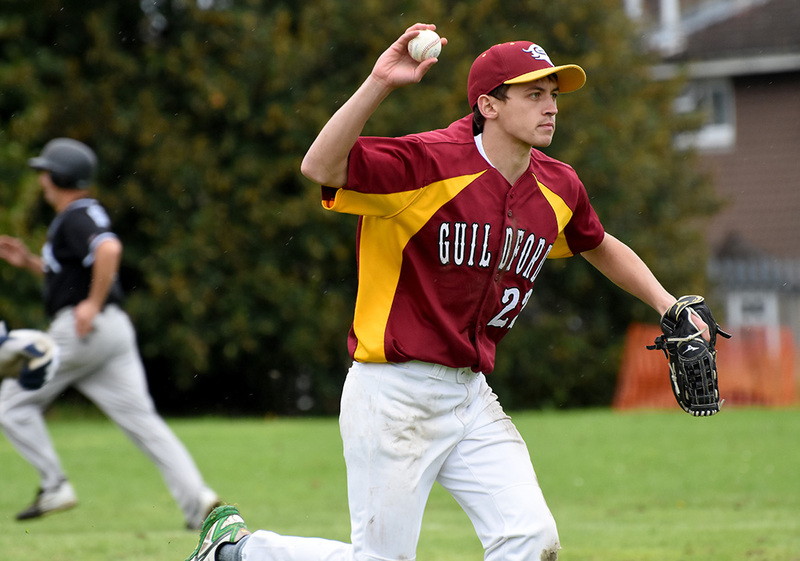 For the second time in the inning, a batter was struck out and reached first after young debutante Myles Buckton hustled down the line and would eventually score on an over throw by the Bracknell catcher. The bottom of the 7th was a quick affair with the Garner and Ward linking up to get the first 6-3 out and another debutante, Brent Brakeboer, taking an important catch at second base before Heydenrych struck out the 4th batter. Lloyd led off the 8th with a double and scored on a Garner RBI single before Bracknell shut down the bottom of the order. Heydenrych struck out the first batter before Lee Coster crushed a towering home run to left centre field. Bracknell went on to score another run to enter the top of the 9th with the score 19-18 to the Mavericks. 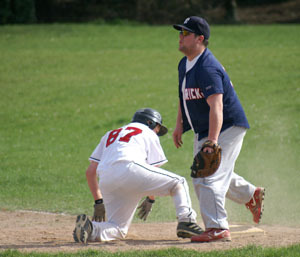 Bracknell shut down the Mavericks in the top of the 9th and the Mavericks just had to keep Bracknell off the bases. This was easier said than done with tiring battery, the Inferno took advantage with a walk and a hit before Ward took the mound to try and keep further Inferno runners off base. Lee Coster came through again for the hosts hitting an RBI single to take the victory for the hosts. This was a heartbreaking lose for the play-off chasing Mavericks who had hustled hard all day. On the day, three full debuts in Myles Buckton, Brent Brakeboer and Tom Sullivan were great positives for the Mavericks, scoring runs and working hard all day.